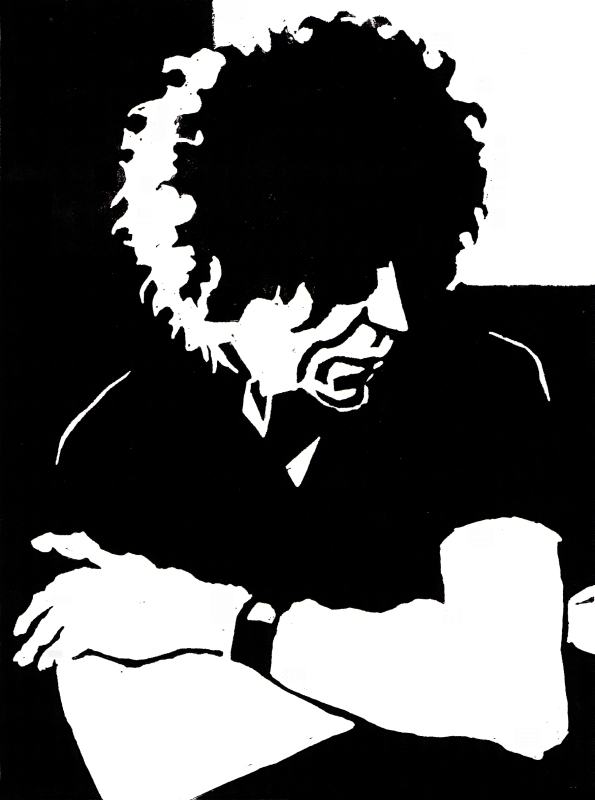 Brett Whiteley described Bob Dylan as ''the most satisfactory voice in pop, I think. There's sort of mango and Courvoisier and the best sort of hissing and low gravel Jewishness on it.'' (here). But Dylan's importance for Brett Whiteley went beyond a mere appreciation of the voice. "He found an intellectual and spiritual brother in this man, whom he eventually met almost thirty years later. Brett was obsessed with poet-musician Dylan ... He collected his albums and was intimate with every song as though they were speaking to him directly. He listened to Dylan almost daily for most of his life." Brett Whiteley had himself always wanted the gift of music making. He had wanted to be a rock star. If he couldn't have the fame, notoriety and kudos that came with rock stardom, then he would live the life of a rocker as an artist. Brett Whiteley played Dylan's music full bore as he painted. He hated silence. Couldn't work in silence. He even soundproofed his studio so that working in early hours would not attract complaints from the neighbours. Back in 1967 Brett Whiteley moved to New York for a couple of years. He made his home in the crazy Chelsea Hotel. Hilton & Blundell provide a lively description of the setting: "'The Chelsea was not part of America, had no vacuum cleaners, no rules, no taste, no shame,' wrote former resident Arthur Miller, 'It was a ceaseless party.' It was where Dylan Thomas died in a drunken stupor and Sarah Bernhardt slept in a huge coffin in the pyramid-like cottage on the roof. ... Arthur C. Clarke wrote 2001: A Space Odyssey in its seedy rooms. It was Andy Warhol made one of his first films, Eugene O'Neill and John Huston wooed lovers and punk rock-master Sid Vicious would kill his girlfriend. It was the alma mater of New York pop culture. ... Rock hell-raiser Janis Joplin became Arkie's (Brett's daughter) occasional baby-sitter ... Brett would talk about how Jimi Hendrix would riff up and down his guitar when they were together." The Chelsea Hotel was immortalized in song by Leonard Cohen with a song of the same name celebrating his tryst with Janis Joplin. At one time or another, Tennessee Williams, Thomas Wolfe and Gore Vidal had stayed there. The Mamas and the Papas and the Grateful Dead could be seen visiting. It was also the centre of the Manhattan drug trade for artists, especially musicians. The Chelsea Hotel was also where Bob Dylan lived in the 60's, where he wrote Sad Eyed Lady of the Lowlands. Brett kept a huge portrait of Dylan on the wall of his modest penthouse apartment there. It was an acquaintance and adoration that would last the rest of his days. 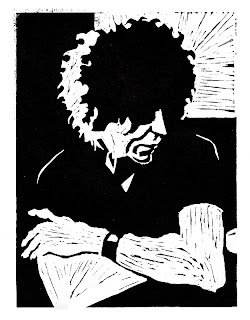 I sometimes wonder whether Brett Whiteley didn't style his Afro hairdo after Bob Dylan. Yes, Brett had naturally curly red hair that would grow into a mop when long (Donald Friend in his diaries described it as "a great frizzy 'Orphan Annie' halo"). But the shape and tight ringlets, and the comment someone made about how wiry and stark it felt to the touch makes me wonder if he maintained it using product to get 'the look' of his idol. Brett Whiteley's hair has become a motif for me in this series. The 1967 is also when the rock musical Hair blew us all away with the same free-wheelin', high-energy, experimental, counter-culture celebration that i believe marked Brett Whiteley's out-look. Hilton & Blundell describe the occasion of Bob Dylan's 1986 Australia tour press conference. "Brett was frantic about what to ask his his hero. He sweated on it for weeks before the Great man arrived, while friends contrived to have Dylan's press conference held at Brett's 'stude' in Surry Hills." Brett's circle said that he was thrilled to have Dylan there but also desperate for Dylan to respond and understand what he was on about. When finally it was Brett's turn to ask Dylan some questions, it was as if Brett believed a cosmic collision of personalities was about to take place according to Kate McClymont. She saw Brett as wanting verification from Dylan about his own sources of inspiration and his benediction. But this press conference did not deliver the public affirmation Brett had wished for that he and Dylan were inspired artistes together. Brett's sister Frannie writes of the time in 1992 when Bob Dylan came to Sydney for a return tour. Brett had bought tickets to every show and carried with him every night a copy of the catalogue from his recent exhibition in case he got the opportunity to present it to Bob. Dylan's minders were under orders not to admit anyone new to his dressing room. But Brett was not new and the opportunity came. Dylan looked at drawings and asked, "How'd you do that man?" Brett was elated over meeting, "Tastic". And what of Bob Dylan? In this second version of my linocut i deliberately inked the cuts so that they would show, rather in the style of early German Expressionist woodcuts, while in the top version's printing i had masked out these cuts with paper to obtain clean areas of white. Which is better is a matter of taste. the two versions of your linocut, are great! Thanks, Denise. I imagine you have used linocut extensively, with color over pattern, to achieve thoseamazing flat-surface studies of people. At the moment i want to keep the stark, extreme contrast of B&W. I'm hoping it will help me say something about Brett. And thanks for your comment on my previous post about Brett Whiteley in the wilderness. As you no noticed, i decided to delete it a few hours after i posted it. The work was just not ready for showing. I still need to do a lot more thinking about who to tackle a large oil painting on the subject. Very interesting post and great lino prints. It's hard to choose--I do love the German Expressionists' works. Yes, Hallie, i really like the way German Expressionist prints speak of the process used. And it's the cut marks, how they were made, underwhat emotional conditions, the lends expressive power to what would otherwise be a clean flat surface. Harry, I am catching up with your newest posts..I was interested in how you see that Dylan influenced Whitely and visa versa. Dylan had a fairly recent art exhibit of his own (and the event was controversial, because Dylan was accused of copying compositions from famous photographs). It does seem clear that Dylan no doubt would have held Whitely in high esteem. What a shift of "power"! Love the linos that you've done of Whitely. All these works must be quite a sight together. Will you show them all together somewhere? Yes, i remember reading about the Dylan fuss. Whiteley commented to his sister after the meeting that he was surprised how little Dylan actually knew about painting. When is borrowing theft in art? Dylan's paintings looked OK to me. Sorry it's taken so long for me to reply, but i've been out of action for a few weeks. Cheers. I have been perusing posts that I may have missed. These linocuts are stunning! You have distilled these down to only the essentials. There is nothing labored or extraneous. That kind of discipline is so difficult to maintain. At the same time these also communicates the quiet attention needed for carefully listening to music. To have gotten that through such minimal means is remarkable. Congratulations. Thanks for looking back through, Davida. It's something most people don't do, so that often we are only as good as our last drawing. Thanks for the generous comments on the lino cut. Sorry it's taken so long to reply but ive been away from painting and the web for a few weeks. Lovely to return and find your steady interest waiting. Hello Harry , I think U are wright ,it could have been from Bob Dylan look . Your portraits are really greats ! I have to subscribe , so I will have them in my mail , since I am seldom at the pc. A big hug ! Thanks so much, Marialuisa. Your encouragement is a real tonic. Good point about mobile feeds. Time i caught up. I want to subscribe to your blog , not to the comments , how I do it ? Fixed. I've added an RSS feed. Thanks for the request, Marialuisa. I like your picture of Brett listening to Bob. I used to visit Brett and lend him Dylan bootlegs. He told me about visiting Bob in his hotel room one time and he invited me to the press conference where I took some photos. I'll send some more information when I get the chance. Brett's question to Bob was "who from history would you have liked to meet?" but Dylan didn't really answer it. How exciting that you should visit my blog, Tim. I am quite awed that an artist of your stature would give me the time of day. Many thanks for your kind words. You having known Brett makes me feel just one degree of seperation from having known him myself. I'm so delighted that you left a comment. Not that my Brett series is simply some kind of homage. I see in Brett's life and art so many issues relevant to creative practice and the Oz arts culture. So contemplation of Brettness is a wellspring of image making and vehicle for self understanding. Yes, i recall accounts of the press conference and Brett's disappointment and hasty exit. But he had his wish in the end in his own studio. I'd be delighted to see any pics you took at the time or hear about anything else you can tell me about your experience with, and of, Brett. Interesting to hear about your work and being inspired by Brett's life. I feel the same way and learnt a few things watching him paint and talking to him. In 1986 Mark Knopfler who was a friend of his was in Sydney at the time of the press conference and organised a meeting in Dylan's hotel room where according to Brett, Bob immitated a giraffe by lying on his back and waving his feet in the air. At the 1992 press conference Bob left after the questions so Brett followed him out and passed the rolled up drawings to Bob through the window of his hire car. After the 92 studio visit Brett wrote him a long letter and there was talk of doing an album cover and maybe a book together. I think by the time Bob asked Stuart Coupe how Brett was doing, he had already died. I lent him lots of Dylan bootlegs including a 10 LP set of early material. From a dream I'd had about him I felt he had a death wish so I was trying to interest him in things like Aboriginal art and buddhism. He gave me the impression of being always busy as if something was disturbing him, but at the same time he gave everything to the moment, making it seem important, asking questions and examining things with many different points of view. Thanks so much for this wonderful reply filled with revealing detail. I have watched the bit of film of Brett Drawing and painting, watching his whole body move the charcoal in a signature arc. Yes, he developed his 'tricks' and fell back on them as a prop - who doesn't? Amidst it ere great flashes of intuition and just damn good composition that not enough critics have given him credit for. The Mark Knopfler connection is fascinating. I started watching Utube clips on the strength of it and am familiar with the cover Brett made. All great stuff. Thanks for the detail about passing the roll of drawings through the window. I often wondered how Dylan got those works he refrerred to in interview. And that there was on-going correspondance. Kind of puts the imputation on the part of some biographers that it was just all Brett's whishful thinking into perspective. Interesting what you say about your dream. Brett had wrestled with his mortality for some time, methinks - both affronted and confronted by it yet also drawn like a moth. It was already there in his Christie series. A lovely thumb-nail sketch you paint of someone lively, curious, energetic, focused, divergent. I am curious about his approach to Buddhism, though I suspect it was actually more Taoism with its fluxus that attracted him. But there, my understanding is conjecture based on a few biographies. It’s so exciting to have this exchange with someone who knew him well and is a great Aussie artist in his own right. Thanks so much.